A gin pole (derived from gyn, a three-legged lifting device) is a supported pole which uses a pulley or block and tackle on its upper end to lift loads. The lower end is braced or set in a shallow hole and positioned so the upper end lies above the object to be lifted. The pole (also known as a “mast”, “boom”, and “spar”) is secured with three or more guys. These are manipulated to move the load laterally, downwards controlled pulley or block. Gin poles are also used to raise loads above structures too tall to reach with a crane, as placing an antenna atop a steeple, and to lift segments of a tower atop one-another during erection. When used to create a segmented tower, the gin pole can be detached, raised, and re-attached to the just completed segment in order to lift the next. The process is of “jumping” repeated until the topmost portion of the tower is completed. Gin poles are mounted on flatbed trucks as a primitive form of mobile crane, used for lifting and relocating loads, and salvage operations in lieu of a more sophisticated wrecker. Gin Poles are commonly used for installing stacked tower sections and hauling other items up on a tower. Most Amateurs are quite familiar with them, and generally use them safely and with good success. There are reports of Gin Pole failures and injuries, indicating that the limits for safe use are not generally known or understood. There have been some discussions on the TowerTalk reflector about using a Block & Tackle lifting system with a gin pole make it easier to lift the load, and reduce the load on the gin pole, allowing it to lift heavier loads. The gin pole is considered a form of derrick, called standing derrick or pole derrick, distinguished sheers (or “shear legs”) having single boom rather two-legged one. 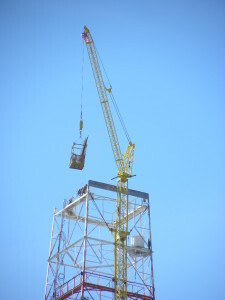 Gin poles used raise loads above structures tall reach crane, placing antenna atop steeple, lift segments of tower atop one-another during erection. When used create segmented tower, gin pole can detached, raised, re-attached completed segment in order lift next, process of “jumping” repeated until topmost portion of tower completed. A derrick is a lifting device composed at minimum of one guyed mast, as in a gin pole, which may be articulated over a load by adjusting its guys. Most derricks have at least two components, either a guyed mast or self-supporting tower, and a boom hinged at its base to provide articulation, as in a stiff leg derrick. Forms of derricks are commonly found aboard ships and at docking facilities. Some large derricks are mounted on dedicated vessels, and known as floating derricks and sheer legs. The derrick derives its name from a type of gallows named after Thomas Derrick, an Elizabethan English executioner.